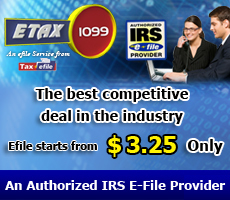 Tax2efile has launched new services and improved prior e-filing systems for Form 1099-Misc, 1099-K, 1098 and 1098-T.
Tax2efile is recognized as an industry leader in e-filing services. With and easy to use website and live customer support from an experienced and well trained staff Tax2efile is always offering their customers the best experience possible. Filing is easy with the improved e-filing system and takes only a few minutes to complete filing. New to these services is the e-filing of Form 1099-K and Form 1098-T available at http://www.Etax1099.com and http://www.Etax1098.com. Mortgage Interest Statement, to report mortgage interest (including points, defined beginning on page 2) of $600 or more received by you during the year in the course of your trade or business from an individual, including a sole proprietor. Report only interest on a mortgage defined on this page. Form 1098-T is used by educational institutions to report payments of financial aid as well as aid reimbursement.